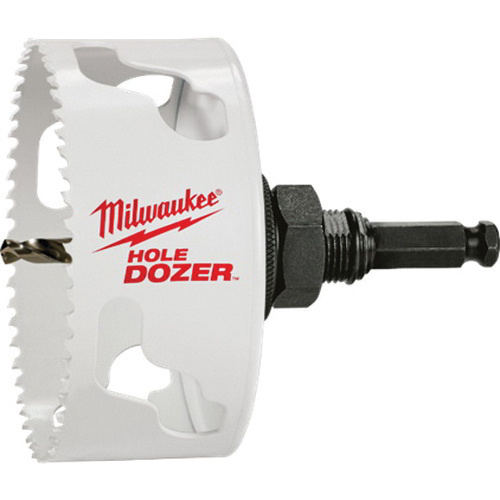 Milwaukee Tool Hole Dozer™ Hole saw features Rip Guard™ tooth with more steel behind the cutting edge for added strength. The tooth has bi-metal construction with 8% of cobalt to ensure added life by allowing increased productivity on the jobsite and hole quality. The 4-1/2-Inch hole saw has 1-5/8-Inch cutting depth and hole diameter of 4-1/2-inches. Plug Jack™ provides all access to slot for faster plug removal. It provides access to lower into the cup for thick material and higher towards the teeth for thin material. Plug Jack helps in increase productivity and eliminates wasted downtime between the holes.